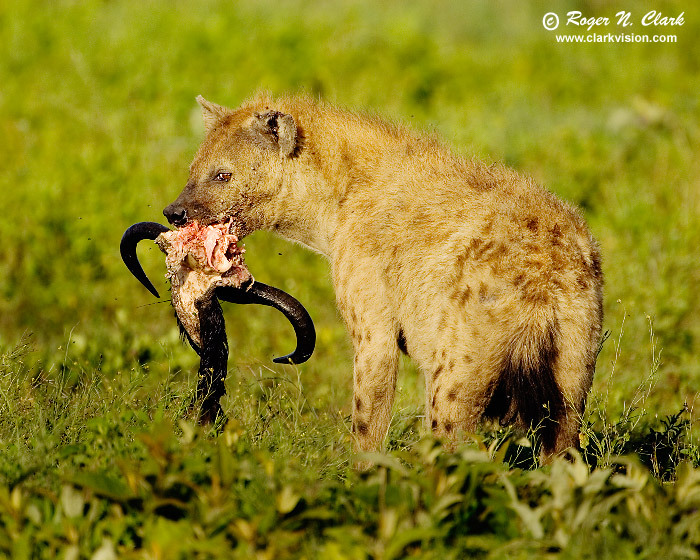 ClarkVision Photograph - Spotted Hyena with Wildebeest Head. Spotted Hyena with Wildebeest Head. On the Serengeti in Tanzania, Africa, this hyena took a wildebeest head after lions were done with their meal. The lions earlier killed the wildebeest and moved on, while the hyenas waited their turn. After the hyenas got their portion, the vultures and birds moved in for the rest. Technical: Canon 500 mm f/4 L IS lens plus a 1.4x teleconverter giving 700 mm at f/5.6. Exposure: 1/1250 second at ISO 200. Full height image, horizontal crop to 16x20 proportions.